Sometimes cultural epicenters sprout up in unlikely places. Take Wooster Street in New Haven, Connecticut, for example — absent any previous knowledge, one wouldn’t expect to find arguably the best pizza in the world here, but one does. Similarly, Newtown Square, PA happens to have a mile-long stretch of Rt 3 in that houses three of the best Italian-style roast pork sandwiches anywhere. 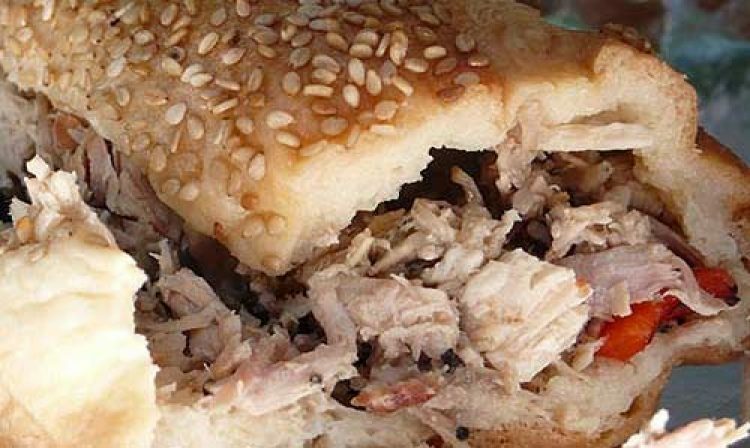 Because Philadelphia is famous for these sandwiches (much like NYC is famous for pizza), it is not all that surprising to find a good pork sandwich in the suburbs — but 3 great ones in one mile? It’s odd for sure, but we aren’t complaining. L & G make our favorite sandwich of the three — a whole pig is de-boned, seasoned with six fresh herbs, and roasted (with skin intact for extra flavor) overnight in a brick oven rotisserie, then pulled/chopped and mixed with an Italian-style gravy. The cooking method for this pork renders the fat slowly, creating meat that is tender, juicy and extremely flavorful. Pulling the meat instead of slicing it gives it a texture more like Carolina Barbecue, which is perhaps what makes this sandwich extra tasty. Once the meat is ready, a Sarcone’s-style sesame semolina roll is scooped (to remove excess insides, if desired), layered with sharp provolone and house-made roasted red peppers, and piled high with steaming pork. These sandwiches are available on the patio outside Luigi and Giovanni’s Italian Market (located just off Rt 3 on Chapel Rd.) on weekends only, until they run out. Chicken cutlet and Italian sausage sandwiches are also available. Though it is mostly a takeout business, there are a few small tables available if you just can’t wait for sandwich bliss. The Roast Pork Italiano (pictured above), similar to Luigi and Giovanni’s, is served with provolone and sweet roasted peppers. Cut Above’s pork is thin-sliced in a more traditional manner, however, creating a different texture. Thinly sliced garlic is slipped into the folds of the meat, plenty of Italian spices are mixed in and it’s all piled on a freshly delivered Sarcone’s roll, resulting in an extremely flavorful sandwich. Cut Above offers a wide variety of other Italian-style hoagies and hot sandwiches, all on that great Sarcone’s bread. On the final Saturday of every month, Soprano’s Deli offers freshly-roasted porchetta sandwiches with sharp provolone and your choice of broccoli rabe and/or roasted peppers. (Interestingly the only of the three that offers rabe, the traditional Philly topping to Roast Pork Italian. It may be possible to get at the other places — I have not asked because I prefer peppers.) The pork itself is chopped into chunks and served in gravy. Though we prefer the L&G sandwich, Soprano’s wins our pick for the best atmosphere: Picture walking into an Italian grandmother’s kitchen during the holidays, with regulars sitting around sipping espresso and eating from an endless spread of food. Service is prompt and friendly, but I honestly felt like I was at someone’s house, not a restaurant. It’s a shame they don’t serve porchetta more often, though there is an extensive menu of other hoagies and Italian dishes to choose from for the rest of the month. I’ve only had Luigi’s and it is divine! The guy who serves the sandwiches, though, is perpetually grouchy! The best things about Luigi’s is the pork sandwich. Everything else is mediocre, very overpriced, and the staff is downright mean. The staff at Cut Above is not very nice either (think Seinfeld’s soup Natzi – they are more concerned with who is coming in or walking by than whom they are waiting on). I pick Soprano’s above the other two – nice people and great food at more reasonable prices. It really is like being at a family home – a nice family’s home – not your mean neighbor’s home where all of the neighborhood kids are scared to go for Halloween. We had the (100% Italian) in-laws over for lunch this past Sunday. I stopped by Luigi and Giovanni’s and picked up a couple of pork sandwiches, chicken parm, meatball, and sausage and peppers. The meatball while not BAD, just didn’t stand out like the other 3 did – they are amazing. It’s hard to pick a clear winner between the pork, sausage & peppers and chicken parm. The chicken parm came in a white cream sauce, and while not traditional, it could be the stand-out if I REALLY had to make a choice. The in-laws gave two very enthusiastic thumbs up, and even took leftovers (this rarely happens). I found the guy serving sandwiches to be quite friendly.